Profound International and local journalist, Jeff Koinange narrates how much of a struggle it was for him and his wife, to have their son. We really tried to have him, and when we finally did, we said we´d do our best to give him everything we never had, including the both of us, a father and a mother, which I particularly never had. Up and Close with blogger, Yvonne Aoll, the veteran Citizen TV Journalist shared. Don´t step into anybody´s footsteps, don´t try and be like daddy in any way, no pressure to do what your dad did, do what you want to do. Carve your own path. This comes in just days after the JKL Live Presenter articulated that he has no regrets for the fact that his father passed on while he was still young. Jeff explains that, had his affluent father lived longer, he would have been brought up a spoilt brat. 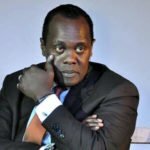 The post Jeff Koinange narrates his excruciating struggle with the wife to sire a son appeared first on Ghafla! Kenya.